Guillermo del Toro's 1997 horror flick will clickety-clack its way to Blu-ray this September. 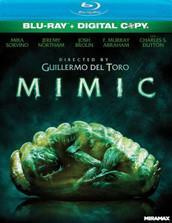 In an early announcement to retailers, Lionsgate is working on 'Mimic' for Blu-ray on September 27. Specs have yet to be revealed, but supplements include: Introduction and Audio Commentary from Director Guillermo del Toro; Behind-the-scenes retrospective featurette; Featurette looking at the creatures in Mimic; Deleted/Alternate Scenes; Outtakes; and Storyboard Animatics.